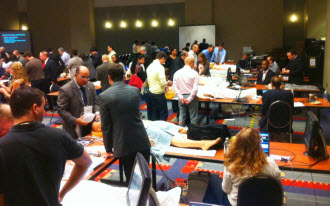 Recently, WISER staff conducted a difficult airway workshop at the2012 American Society of Anesthesiologists Conference (ASA) which was held at the Walter E. Washington Convention Center in Washington D.C. WISER provided all of the simulators and equipment that were used in the workshop. WISER Associate Director of Anesthesiology programs, Joseph Quinlan M.D. was on hand to moderate the sessions. Also on hand to facilitate were WISER instructors Ryan Romeo M.D., Robert Krohner D.O., Shawn Beaman M.D., Theresa Gelzinis M.D., David G. Metro M.D., Cynthia Wells M.D. and Larry Kobulinsky.